This information is a guide only for use by non-government organisations and service providers as a training tool (supplementary to training) and is not intended as medical or professional advice. Users must seek appropriate medical or professional service. The State Government of South Australia accepts no responsibility for the suitability or completeness of the information and expressly disclaims all liability for any loss or damage arising from reliance upon any of the information. Stop before you begin, you must review the support plan of the client being assisted. Think about the task, any equipment needed and the readiness of the client. Think about other options if this task cannot be done safely. Assess the client by watching/talking to them to see if they are willing and able to participate in the task. Review other options available if client not ready for task. Talk to supervisor/manager about other options. Muscular or soft-tissue injury to client from incorrect handling, movement or posture. Muscular, soft-tissue or skeletal injury to workers from incorrect movement, posture, over-reaching or lifting the weight of the client. Cross-infection from using another client's slide sheet. a. Follow all steps of this Safe Work Instruction (SWI). b. Minimum of 2 workers for this task. c. Be aware of movements during task, do not exceed your ability. d. Communicate with client and other workers at every step of this task. Refer to client's support plan for specific information. Ensure handling is done with flat open hands (not grasping with opposing thumb and fingers). Make sure client's slide sheet is clean and in good condition. If bed has brakes, check these are on. If bed has sides, lower or remove these. Assist client to roll to side. One worker on each side of bed, unless otherwise indicated in client's support plan. Refer to SWI for Rolling and Repositioning a Client on how to safely position a client onto their side. Workers position hands, using pushing/pulling motion to gently roll client onto side. Fold slide sheet in half. Roll slide sheet up at one side of the folded sheet, not at the 'open' or 'folded' ends with the open end towards the top end of the bed. (refer diagram). Position slide sheet beside client. Ensure client is in a stable side position, with second worker keeping them steady. First worker places rolled slide sheet along the back of client, making sure the "rolled end" of the folded sheet faces the client. Roll client onto back and retrieve slide sheet. Roll client back onto slide sheet. Second worker to slide hand in palm up and catch the rolled end of folded slide sheet at thigh or neck. Second worker pulls the slide sheet through, unrolling the sheet. Spread out slide sheet and position client's legs. Spread out slide sheet evenly. Ensure the "open" end of the folded sheet is under client's head, facing the top of the bed. 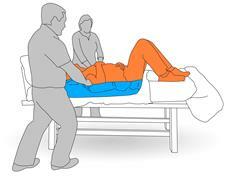 Each worker to lift client's leg, bend at knee and reposition their feet on to bed (or ensure legs do not drag during move) (refer diagram). Workers to take starting stance. Both workers are to stand level with client's head. Stand facing opposite corner of the bed and adopt a short stride stance. Pivot feet and stance so toes face toward client's opposite hip. Both workers to grip top sheet only, grasping near the clients shoulders. Workers to move slide sheet. Counting in, both workers to rock back onto leg closest to head of the bed while gripping top of slide sheet. This movement will slide the client on the top sheet toward the head of the bed. Remember to use your body, not shoulders and maintain good posture without leaning or twisting. Gather slide sheet together and tuck under client. Make sure client is comfortable in new position; place a pillow under their head. Second worker to gather slide sheet together, to be level with the small of the client's back. Second worker to tuck the gathered section underneath the sheet through the area of the small of the client's back. Retrieve slide sheet from other side of client. First worker locates the tucked sheet under the remaining sheet above. Pull through the tucked sheet, without causing friction or pulling on the skin of the client. Task for moving a client up a bed is now complete. Make sure client is safe and comfortable. Replace or raise bed sides if required. Place slide sheet in correct storage areas. Document any incident and report to supervisor immediately.